It seems like All Time Low have just had never ending success. 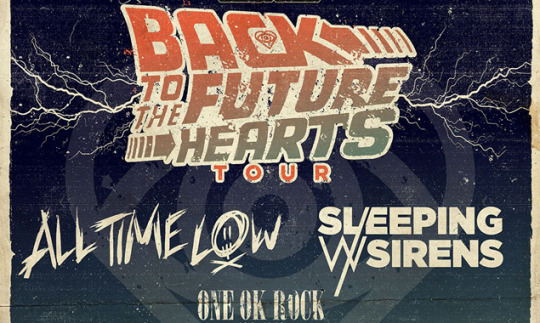 This year marked the release of their sixth album, Future Hearts, they filmed a live DVD at Wembley Arena, had a Spring tour supporting Future Hearts and now they’re back again for the Back to the Future Hearts Tour, this time with Sleeping With Sirens, Neck Deep, and One OK Rock. Sleeping With Sirens is their direct support, and with the dedicated and huge fanbase that they have accumulated throughout the years, I couldn’t think of a better band to join this tour. They kicked off their set with “Kick Me,” one of the singles from Madness, their fourth album that was released earlier this year. Their large logo illuminated the room and drummer, Gabe Barham, is lifted on a tall riser with his drum kit that has him hover over the entire band. Smoke fills up the entire stage as the crowd goes crazy and the band is feeding off their energy. The band goes on to play an older song, “Do It Now, Remember It Later,” and all the older fans sing their hearts out alongside vocalist, Kellin Quinn. Quinn’s stage presence is one you have to see to truly understand. He knows how to engage the audience, whether that means bouncing around the stage or climbing the speakers and he never misses a beat. Quinn’s vocal range is amazing and it definitely shows off during the band’s acoustic version of “With Ears to See and Eyes to Hear,” and fan favorite, “Roger Rabbit”. Kellin continues to prove that he can do anything by impressively beatboxing during the two songs. The setlist continues on with a mix of songs from different albums and their set ends with one of their most famous songs, “If You Can’t Hang.” The audience does not disappoint as almost everyone in the room is singing along, some even crowd surfing trying to get on stage. The band’s high energy and mix of songs on the setlist made me pumped and really into watching their set. The next time they come back to town, I know for sure it’ll be worth seeing again. The time comes for All Time Low to hit the stage. The lights dim, and the beginning guitar riffs to “Satellite” start to fill the room. Frontman, Alex Gaskarth, comes out and all that is visible is his silhouette with blue backlight on him. The crowd goes wild and sings along to every single word. The setlist contained a good mix of their singles and even included some fan favorites like “Poppin’ Champagne.“ Only two songs in and guitarist Jack Barakat has accumulated numerous bras on his microphone stand thrown onto stage by fans in the crowd (are any of us surprised?). All Time Low are no strangers to the stage, taking advantage of every inch of it, and sometimes you don’t even know where to look because there’s so much to look at; but it’s amazing. Before playing “Missing You,” Gaskarth tells a story about a fan who was an addict and upon listening to this song, it spoke to him and helped him get treatment and overcome his addiction. Gaskarth takes advantage of having this moment on stage and shows the band’s true appreciation of the overwhelming support they have gotten by thanking everyone in the crowd. As the band finishes playing “Old Scars/Future Hearts,” the crowd starts screaming and chanting All Time Low, being hopeful that they’ll come out and play some more songs. The fans got what they asked for and the band returned for an encore, playing “Kids In The Dark” and “Somethings Gotta Give.” Right as they begin to play their final encore song, “Dear Maria, Count Me In,” Gaskarth announced he will bring someone on stage and it’s no other than 5 Seconds of Summer’s’ Michael Clifford. The crowd goes absolutely insane as Michael comes out to play their last song with them. They first start messing around and play a Green Day cover, but then go right into it. I have seen All Time Low a lot, but this was definitely one of the best All Time Low shows I’ve ever been to. There hasn’t been a show where they had the same performance because each show feels like a mix of a comedy stand-up and a pop-punk show. Their raunchy humor and their passion for their art is what sets this band from everyone else. All Time Low are one of the most genuine bands out there, and seeing them live is something you will not regret.